The Sebastopol Goose originated in southeastern Europe. While sources do not agree on the precise location, they all point to the region around the Black Sea. The Poultry Book, published in 1909, states that they were named after Sebastopol, a Russian city from which they were imported. It was developed from the wild Graylag goose which is native to Europe. The American Poultry Association recognized the breed in 1938. Sebastopols are medium-sized geese, weighing 12 - 14 pounds when mature. They have large, rounded heads, prominent eyes, slightly arched necks, keel less breasts and dual lobes (fatty lobes that hang below the abdomen). The plumage of the head and upper two-thirds of the neck is normal, while that of the breast and underbody is elongated and well-curled. The soft, fluffy feathers of the back, wings and tail have flexible shafts, are attractively spiraled, and in good specimens are so long that they nearly touch the ground. The curled feathers prevent flight making them easier to confine. Sebastopols produce 25-35 eggs annually. When handled carefully, they have a quiet and pleasant nature. When selected for an unusual characteristic, great care must be taken to insure that vigor and fertility of breeding stock is not overlooked. Robust health and adequate size should be the foremost selection attributes. Secondarily, select for birds with well-curled breast feathers, flexible flight feathers, and back and tail plumes that are long, broad and spiraled. To keep Sebastopols looking good, clean water for swimming should be made available. 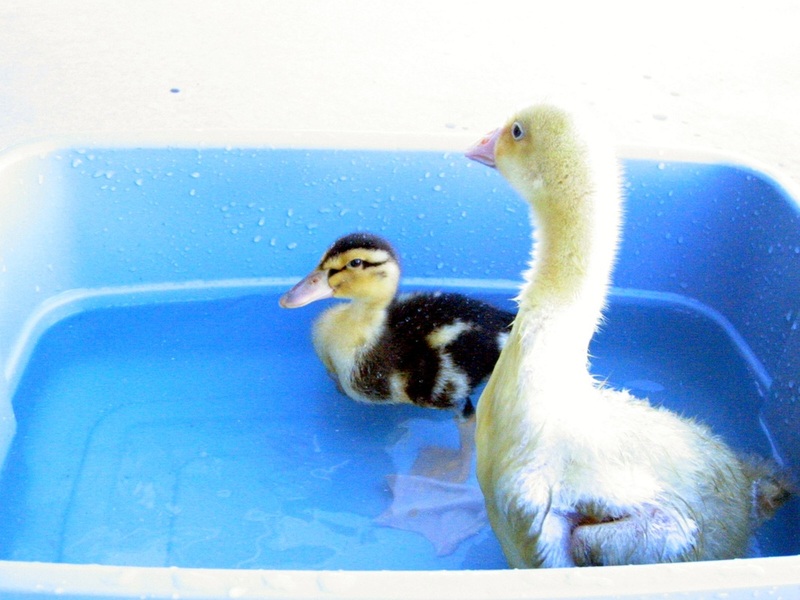 While Sebastopols are hardy and are being raised successfully in cold climates, it is a good idea to provide more protection during wet, cold, and windy weather than normally afforded other breeds, as their loose fitting feathers do not provide as much warmth, nor do they shed water as well. Ganders can be mated with one to four geese. In the spring of 2010 we purchased a pair of Sebastopol Goslings that were supose to be a Male & Female from a well known breeder in the Northwest. Our "Adam and Eve" Turned out to be "Adam and Steve"! After waiting for eggs that of course never came! One of the people that I incubate eggs for aquired a (one year old) breeding pair of Sebastopols and I incubated some of the eggs for them. We now have what we are praying is a female Sebastopol gosling. She is just a month old now so with a lot of love and care we are hoping to have some (eggs) to incubate this coming spring (2013). I will update this page with pictures and more information as time allows! Thank You! Please check back for more information! 2013 New Sebastopol Gosling with a Silver Appleyard Duckling! 2013 was a good building year for our Sebastopol geese. We were able to add a few to our flock and sold a few to select individuals that have been waiting some time for us to get them laying and hatching. We also sold a few eggs and had the customers reporting back they were very happy with hatch results from the eggs! Our weather this winter was very cold & dry through November & December and All the Geese have done very well. It has started warming up some here now and a couple of the Older Geese have started to lay. After "visually" checking fertility looks good. Our White Curly Sebastopol Geese started laying on January 5th this year and I have eggs in the Incubator for the first three hatches of the year. First hatch due right around Valentines Day. The Fertility has been established so I will also offer a limited number of Hatching Eggs for those that would like to incubate their own! I set the first group of Sebastopol eggs on Friday January 17th for a projected Hatch date on Valentines Day Friday February 14th. Monday January 27th: Day 10 and We have five Sebastopol eggs that are developing! I set another 8 eggs today so we’ll see how they do in another week! This is still early in the season but looks like a start to a great hatching year!